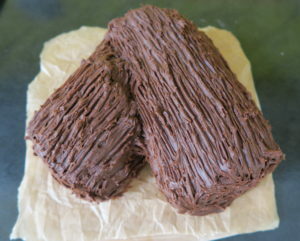 I’m not a huge fan of Christmas cake so my absolute favourite dessert to have at Christmas time is a Chocolate Yule Log! 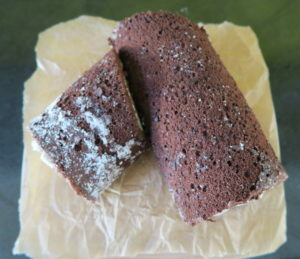 It’s a light chocoate sponge filled with whipped cream and coated in a rich chocolate ganache – what’s not to like! This recipe is based on a Mary Berry one, with a few of my own touches. 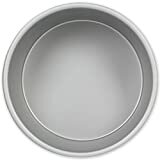 I’ve made it so many times over the years I’ve lost count… It always disappears fast whenever I serve it! And I’m always hoping there’s enough left so I can go back for another slice! 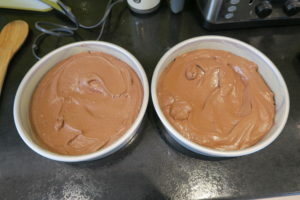 To start I make the ganache topping because it has to cool down and set in the fridge for a few hours. 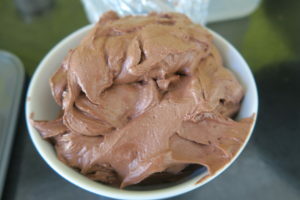 I heated the double cream and butter on a low heat, then I mixed in dark chocolate until it was smooth and glossy. Then I popped it in the fridge for a few hours. For the sponge I used my food mixer to whisk up eggs with caster sugar until frothy and at the ‘ribbon stage’. 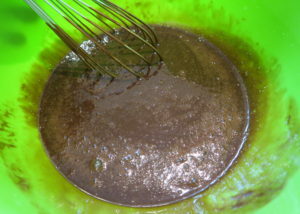 Then sifted in self-raising flour and cocoa powder and folded it into the egg mixture gently so as not to lose the frothiness. 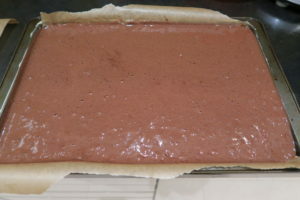 I poured the mixture it into a lined baking tray with a lip and baked for 10 minutes. 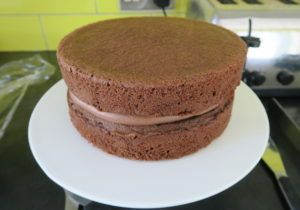 Whilst it was baking I prepared a sheet of baking paper dusted generously with icing sugar, when it was done I tipped the sponge out onto it straight away. 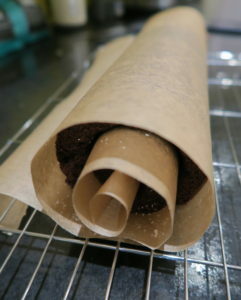 Then I peeled off the baking paper it was baked in and rolled the sponge up as tight as I could, taking the fresh baking paper with it. I left it to cool fully still wrapped in the paper. Once the sponge was cold, I whipped up some double cream with icing sugar and vanilla for the filling. 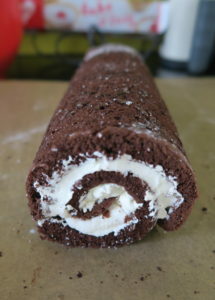 I unrolled the sponge and spread out the cream onto it using a palette knife. Then I rolled it back up again. I cut the roll diagonally at one end and positioned on a serving board to look like a branch. The ganache was nice and thick by now. I piped it onto the sponge and used a fork to create texture. I made a holly sprig with fondant and dusted the Chocolate Yule Log with icing sugar. If like me you stand in the camp of not liking Christmas pudding or cake, the Christmas Yule Log is a great alternative dessert idea for Christmas Day! I usually make about three of these every year to take to all my Christmas events and meals. To make it a bit easier, you don’t have to cut the roll, you can just leave it straight too. Recipe slightly adapted from Mary Berry. You can find more of my Christmas recipes by clicking here! I started the evening I made this with the plan to make a loaf version of the Pumpkin & Chocolate Brownies I made in October. However, I forgot to get any cream cheese, which was one of the main ingredients. Luckily, my housemate had left some bananas on the side, with a note saying they were unwanted. So I jazzed them up with some extra flavours and this Spiced Banana, Choc Chip & Bourbon Loaf was born! 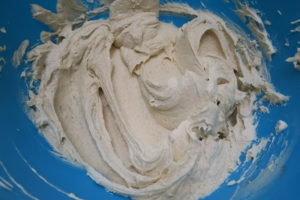 Into a large bowl I stirred together plain flour, bicarbonate of soda, cinnamon, salt and ground ginger. In another bowl I mashed up the bananas with a fork. It’s best if the bananas are starting to brown, don’t use the just ripe ones as they will be too firm. In a third bowl I creamed caster sugar with butter until fluffy. I added the mashed up bananas to the sugar and butter mixture along with egg, milk, and vanilla extract and mixed well. The flour mixture then went into the banana mixture, along with chocolate chips and bourbon (you can also use brandy). I poured the mixture into a 1lb loaf tin. I baked it for 45 minutes – I covered it with foil for the last 10 minutes so it didn’t burn on top. The Spiced Banana, Choc Chip & Bourbon Loaf is so moist and delicious, the mixture of banana, spices and chocolate flavours are divine! I think it would also make good mini loaves. 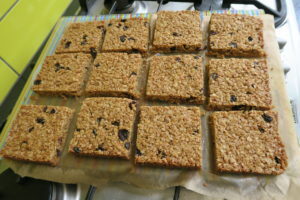 The first time I made flapjacks (in 2012) I posted them to my boyfriend and my brother as surprise care package. My boyfriend described them as ‘immense’ at the time and having made these again recently I really agree! 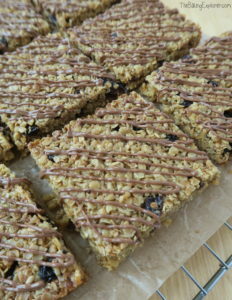 This flapjack recipe is so easy to follow and you’ll end up with buttery oaty flapjacks with a sweet drizzle of chocolate on top. Delicious! 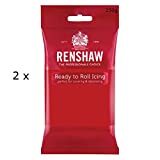 They also keep for a week in an air tight container so are perfect for sending to friends and family, enjoying on picnics and road trips, and taking to work or school as a snack. First I melted the butter, golden syrup and light brown sugar on a low heat until the sugar had dissolved and everything was melted. 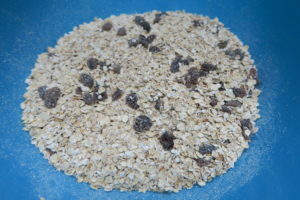 I poured the porridge oats, linseeds and sultanas in a bowl and mixed them together. 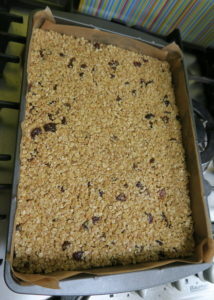 In went the melted butter and sugar, and I stirred it until the oats were all coated with the mixture. 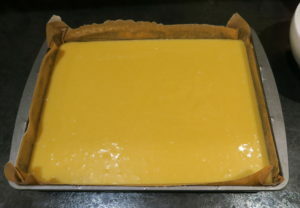 I put the mixture into a greased and lined traybake tin and pressed it down with a silicone spatula to smooth out the top and create an even finish. It baked on 170C/150C Fan/300F/Gas Mark 2 for 35 minutes until it was golden all over. I left it to cool completely. I used a sharp knife to cut it into squares, then drizzled the melted milk chocolate all over. 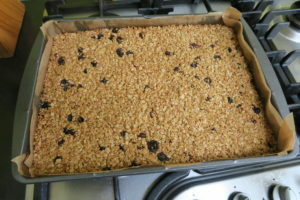 The flapjacks were so yummy and buttery, and very moreish! My boyfriend was happy to see these come out of the kitchen again! 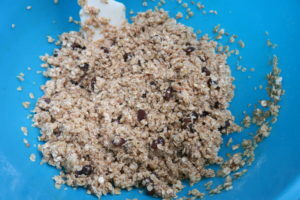 Put the chocolate into a small piping bag and snip the end off and drizzle it over each flapjacks. Or drizzle it over with a spoon. One of my favourite parts of both Halloween and the Autumn period in general is the proliferance of pumpkin in all kinds of food and drink. My favourite is definitely Pumpkin Pie but these Pumpkin Cupcakes come a close second. However, I’ve never met a pumpkin baked good I didn’t like! These Pumpkin Cupcakes are so easy to make with tinned pumpkin puree, but you can use raw grated pumpkin if you can’t find the canned kind. 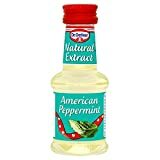 It is so much easier to find nowadays, I get it in Tesco in the American food section or from Amazon (see link before the recipe). They’re topped with a divine cinnamon infused buttercream too! 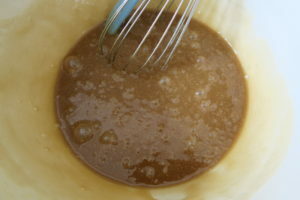 I started by whisking together the light brown sugar, eggs and vegetable oil. Then I whisked in the pumpkin puree. 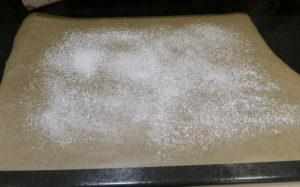 In another bowl I stirred together the self raising flour, baking powder, salt and all of the spices. 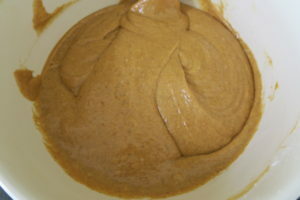 I added the flour mixture to the pumpkin mixture and whisked them together. 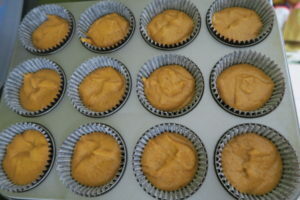 Next I divided the mixture between the cupcake cases. They baked for 25 minutes until they were golden. Whilst the cupcakes were cooling I made the buttercream by mixing the butter, icing sugar, vanilla extract and cinnamon together. 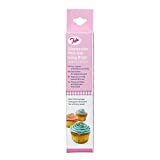 I piped it onto the cupcakes using a Wilton 2D nozzle. 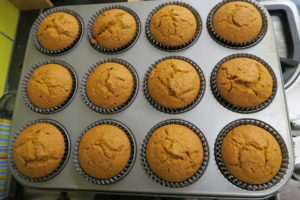 The Pumpkin Cupcakes were gorgeously moist and packed with Autumn flavour! The cinnamon buttercream was the perfect partner, but if you fancy using cream cheese frosting instead check out my Red Velvet Cupcakes for a recipe! If you can't get hold of pumpkin puree you could also use grated raw pumpkin, or butternut squash would work too. 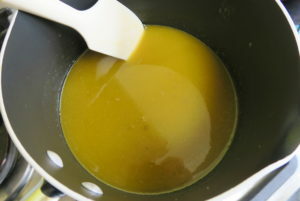 You can also roast or steam the pumpkin, then puree it and let it cool completely before adding to the mix. I absolutely love baking with pumpkin, and you may never have thought of mixing it with chocolate, but trust me it tastes so good! These Pumpkin Cheesecake Chocolate Brownies are the ultimate gooey chocolate treat, and swirled through them is creamy spiced cheesecake. This recipe has taken a couple of tries to get right, but I’ve definitely perfected it. The Pumpkin Cheesecake Chocolate Brownies just melt in your mouth, and the cheesecake swirl is full of Autumn flavours like cinnamon and ginger. Make sure you use pumpkin puree, and not pumpkin pie filling (which is already pre-spiced and sweetened). 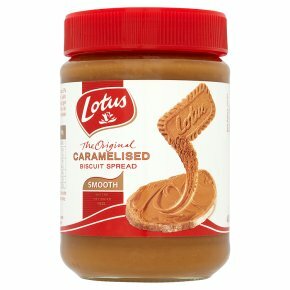 You can easily find it in the USA, and in the UK you’ll find it in the American section of the supermarket. To make the cheesecake batter I whisked together the cream cheese, caster sugar, egg, pumpkin puree, cinnamon, ginger, cloves and nutmeg until smooth with no lumps. Then I set it aside to make the brownie batter. In a pan I melted together the dark chocolate and butter, then took it off the heat. In a bowl I whisked together the eggs and light brown sugar. I poured in the melted chocolate, whisking as I poured. I added the plain flour, baking powder and vanilla extract, and whisked everything together. Then I poured about two thirds of the brownie batter into a lined traybake tine, I added the cheesecake in blobs on top, then added the rest of the brownie batter in blobs on top. Using a knife I swirled together the mixture to create a marbled effect. I baked it on 160C Fan/180C/325F/Gas Mark 3 for 35 minutes. I love how golden and autumnal the colour of the Pumpkin Cheesecake Chocolate Brownies is! These brownies are deliciously moist and the pumpkin spice flavour really comes out in the cheesecake layer. I never thought of mixing pumpkin with chocolate but it works so well. 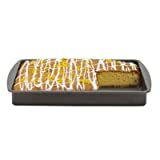 I gifted some of these Pumpkin Cheesecake Chocolate Brownies to friends and took the rest into work for my lucky colleagues and they disappeared fast! They are amazing warmed up in the microwave and served with ice cream – heavenly! Chocolate and mint has got to be one of the most classic dessert combinations out there. 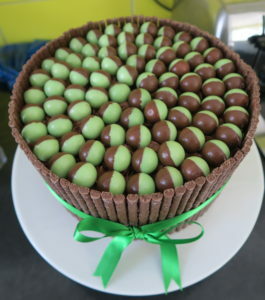 The freshness of the mint cuts through the sweetness of chocolate perfectly. 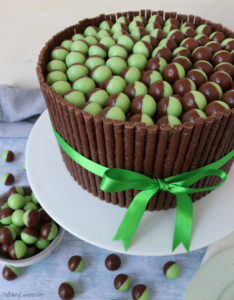 This Chocolate Mint Cake is for all the chocolate and mint fans out there – I know there are a lot of you! It’s a really special and impressive cake, so I think it would be great for a celebration or a birthday. It is also pretty easy to make and decorate too as it doesn’t involve any special techniques. 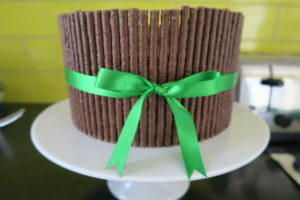 The buttercream is the glue that sticks all the chocolate to the cake, and you don’t have to add the green ribbon but I think it does make the Chocolate Mint Cake look extra special and dressed for a party! 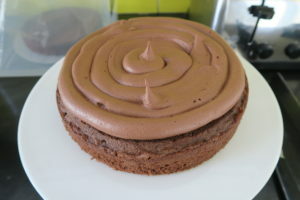 To make the chocolate sponge I creamed the butter and sugar together, then whisked in the eggs and milk, and then whisked in the cocoa powder, self rasing flour and baking powder. 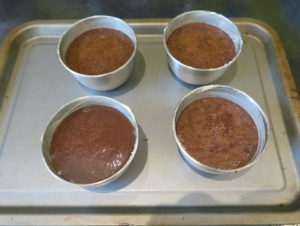 I divided the mixture beteween two lined cake tins and baked them for 35 minutes, then left them to cool completely. For the buttercream I mixed together icing sugar, butter, cocoa powder, milk and peppermint extract. I placed the first sponge on my cake stand and piped some buttercream onto it, then I sandwiched it with the second sponge. 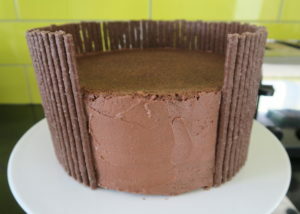 Then I smoothed more buttercream around the sides in a thin layer, and used it to stick the mint Matchmakers all around the cake. Then I added a green ribbon and tied it in a nice bow. 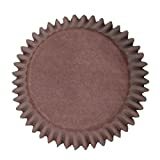 I spread more buttercream over the top of the cake in a generous layer, then placed the Aero Bubbles on top neatly – of course you can just chuck them on haphazardly if you’re not as much of a neat freak as me! 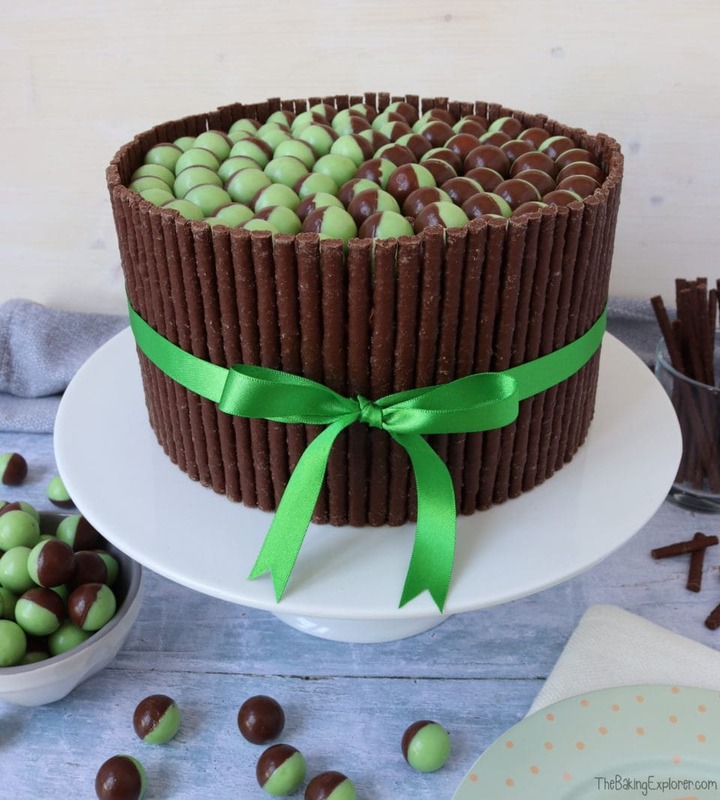 I love how special this Chocolate Mint Cake looks, and you don’t need any cake decorating skills or experience at all to make it look this good! 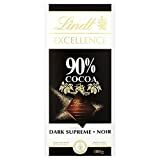 Just a bit of patience as you stick all the chocolates down one by one, and it’s so worth it. 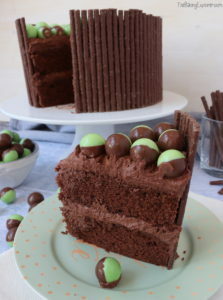 The Chocolate Mint Cake is so yummy, and the coolness of the mint makes it easy to eat a big slice as it cuts through the sweetness – this could be a good or bad thing!! 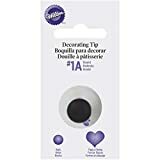 Pipe or spread more buttercream over the top of the cake in a generous layer, then placed the Aero Bubbles on top neatly or in a big pile if you like! 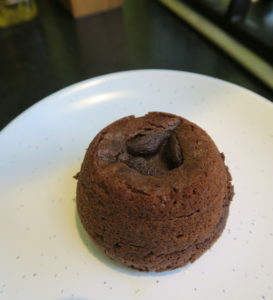 Chocolate Fondants are notoriously tricky to get right, so I’ve tested this recipe several times to make sure it works and turns out delicious gooey in the middle chocolate delights! 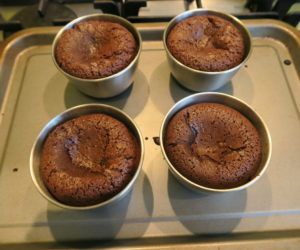 The first time I made Chocolate Fondants I was inspired by The Great British Bake Off, and I’ve been enjoying them for years ever since. They are the ultimate dinner party dessert, and they’re quick to bake and prepare. 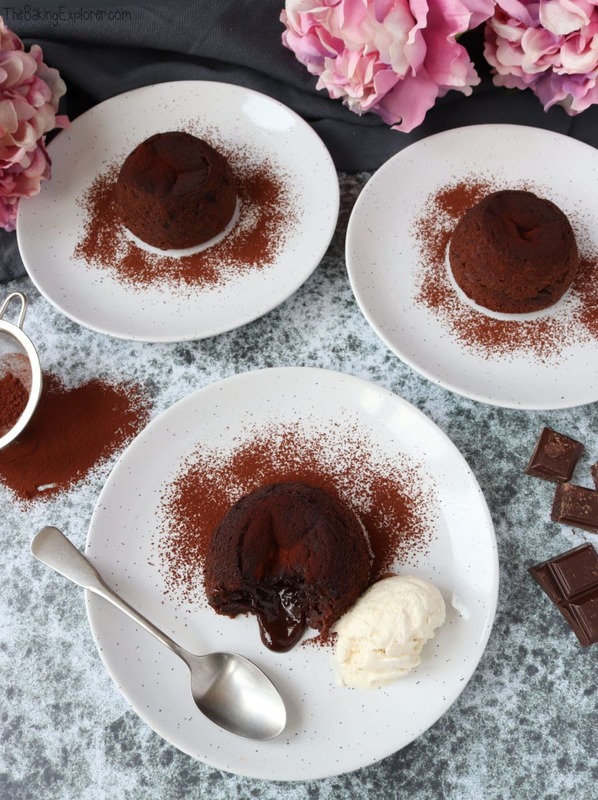 Once you’ve mastered Chocolate Fondants you’ll want to make them again and again! 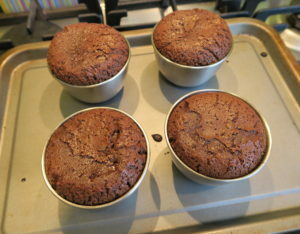 Firstly I prepared my tins, these are called dariole moulds, but you can also use ramekins. I’ve found the best way to ensure the fondants come out easily is to grease the sides and place a circle of baking paper on the bottom. It takes a bit more time to prepare the tin, but trust me, it’s worth it. To start I melted the chocolate and butter together in a glass bowl in the microwave. 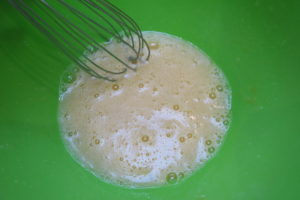 In a mixing bowl I whisked the eggs and caster sugar together. 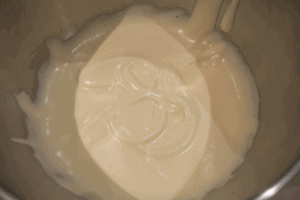 Then I combined the two, whisking as I poured the chocolate into the eggs to ensure the eggs didn’t start to cook. 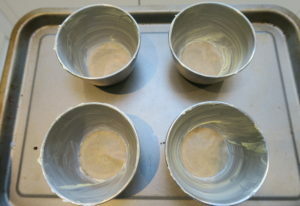 I whisked in the flour, then divided the mixture between the tins. I baked them for 13 minutes in my oven – which I have found to be the perfect amount of time. 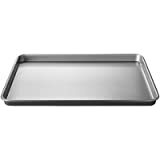 They do sink a little in the middle within seconds of coming out of the oven so don’t let this worry you. 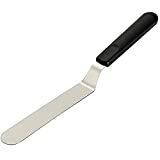 I ran a butter knife around the edges, then put a plate upside down on top of the mould, then flipped it the right way round and gently lifted off the mould. 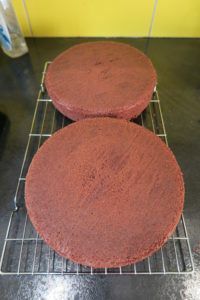 After removing the baking paper I always find the Chocolate Fondants don’t have a perfectly flat top, if you really don’t like this you can hide with a dusting of cocoa powder, a few raspberries or a scoop of ice cream. 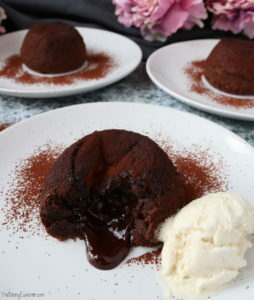 My favourite way to serve Chocolate Fondants is with a good quality vanilla ice cream, I love how the cold ice cream pairs with the warm gooey middle! Recipe slightly adapted from Step By Step Baking. My recent foray in sharing my baking with the world has brought me lots of attention from my friends and family. 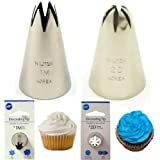 I have always baked, for many years now, but with my blog more people are seeing my kitchen creations on a regular basis. Usually my housemates and work colleagues are my main baking beneficiaries, but now everyone wants a slice! So last week I asked my friend if he wanted to grab some dinner, and he said yes, and can I bake him some cookies? Seen as I am such a nice friend I said yes immediately. Any excuse to bake! I’ve made these cookies so many times as this recipe is so easy and the cookies are SO tasty. 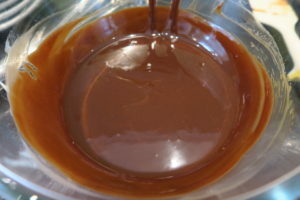 First you melt dark chocolate in a glass bowl over a pan of shallow water. 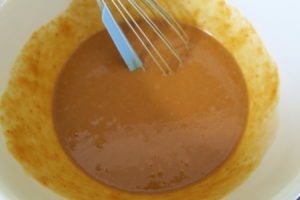 In a bowl mix together light brown sugar and butter. Add egg and vanilla extract and mix well. 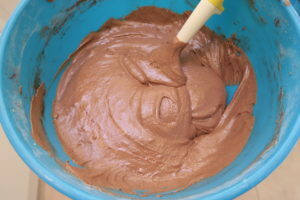 Add self raising flour and cocoa powder to the mixture and fold in. 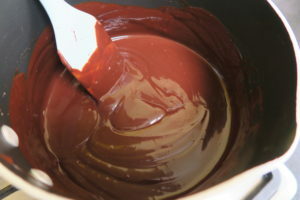 Then add the melted dark chocolate and mix well. This can be a bit tricky as the glass bowl is hot, so be careful, I dropped the entire bowl into the cookie mixture first time I made these, but it all turned out ok! Finally add your chocolate chips. I used white chocolate chips. You can also add nuts, I didn’t use any this time as I knew my friend’s son might eat them, but last time I made these I added chopped almonds. 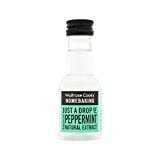 You could also try macadamia nuts, or walnuts. Cover the bowl and chill the mixture for 30 minutes in the fridge. Roll out into balls and flatten down with your hands. About 6 fit on a baking tray, lined with baking paper. The cookies will expand and grow as they bake, so leave space in between them. About an inch is enough. Bake for 12 minutes on 180C/350F/Gas 4. 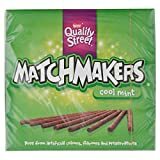 I find 12 minutes produces perfect cookies for me, it will depend on your oven, and how crisp or soft you like them, but I recommend this timing. Leave them on the tray for a few minutes, then move to a cooling rack. 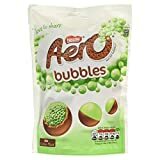 They are really good warm so dig in! The great thing about this recipe is it’s so flexible. You can use other kinds of chocolate in the dough, add your choice of nuts or even dried fruit. You could also try M&Ms or Smarties! Decide what you like and make it work for you! 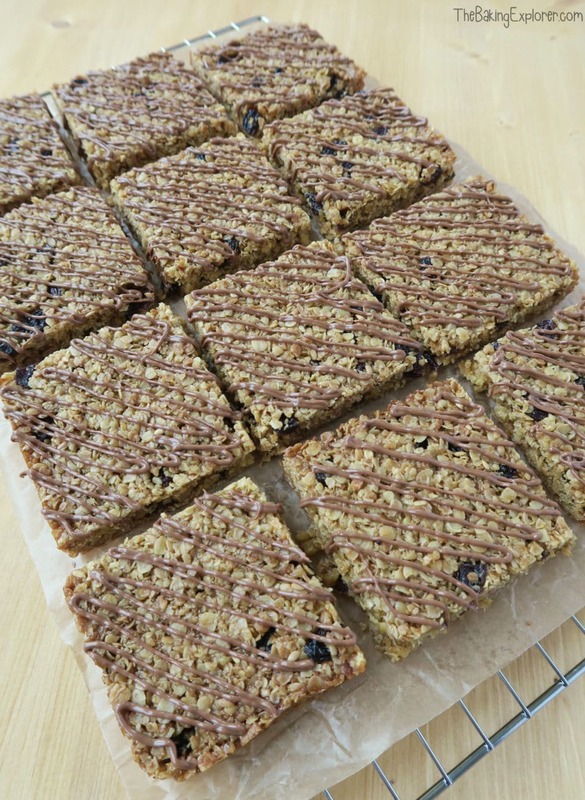 If you’ve not tried blondies before then this delicious and simple recipe is a great place to start. They are the sisters of brownies, and are made the same way but with white chocolate instead of milk or dark chocolate. 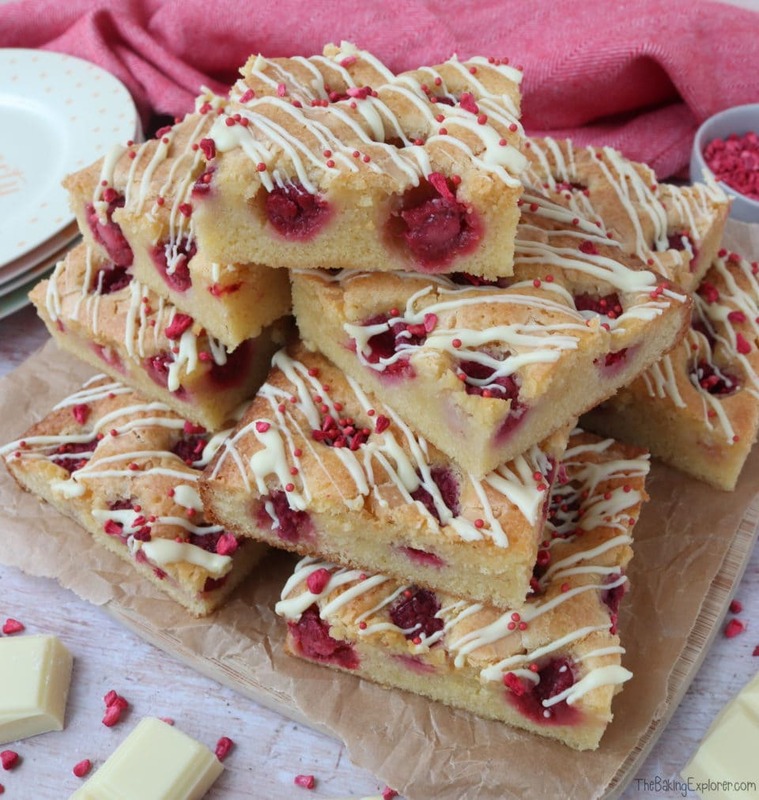 The tangy fresh raspberries in this Raspberry & White Chocolate Blondies recipe are the perfect compliment to the sweet sponge and white chocolate chips scattered throughout this yummy traybake. It’s super easy to make and great for a lazy Sunday afternoon, it would also be fabulous for a bake sale or party! 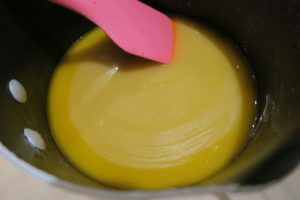 I started by melting the butter and golden caster sugar together in a pan on a low heat. Once the butter was melted, I took the pan off the heat and added the white chocolate. I left it for a couple of minutes, then stirred it in. 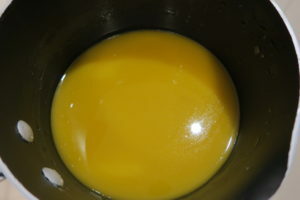 I added the eggs, whisking as I poured them in to make sure the mixture didn’t cook the eggs. Then I stirred in the vanilla. 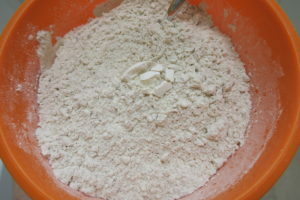 Then I added the plain flour and mixed well before pouring the mixture into the tin. 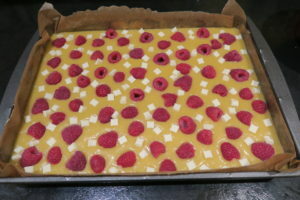 I placed the raspberries all over the batter and sprinkled on the white chocolate chips. I baked it on 180C/160C Fan/350F/Gas Mark 4 for 40 minutes, it was risen all over and golden on top. 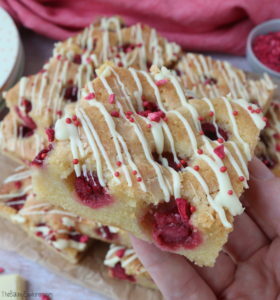 Once the Raspberry & White Chocolate Blondies had cooled I melted some more white chocolate and drizzled it all over them, then I added some red sprinkles and some freeze dried raspberries. 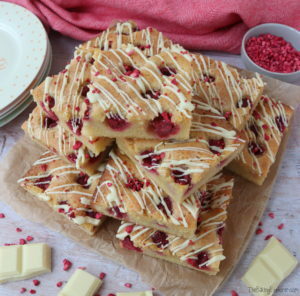 The Raspberry & White Chocolate Blondies were delicious and a big hit with my colleagues! 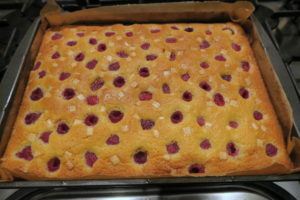 The tangyness of the fresh raspberries along with the sweetness of the chocolate and the sponge was a tasty contrast. They were also so simple, quick and easy to make, so perfect for an easy weekend treat!